RCL Benziger offers well-balanced and effective resources to help meet your parish's adult faith formation needs. Our popular, easy-to-use resources for adults, including catechists and religion teachers, honor the directives of the National Directory for Catechesis. Adults grow in faith as they continue to turn their hearts and minds to God and respond to the invitation of fullness of life as disciples of Jesus Christ. ​Echoes of Faith, one of the most comprehensive online tools available for catechist formation, invites catechists, religion teachers, and those preparing to enter the Church to both learn the teachings of the Church and develop a deeper relationship with Jesus Christ. Apprentices in Faith and Young Apprentices, available online, and the Foundations in Faith series support RCIA directors, catechists, families, adults, and youth who are a part of the RCIA process. Materials for the periods, rites, and ministries of the RCIA support your catechumenate team, catechumens, and candidates every step of the journey. RCL Benziger's many resources for adult faith formation encourage learning about and living the Catholic faith. 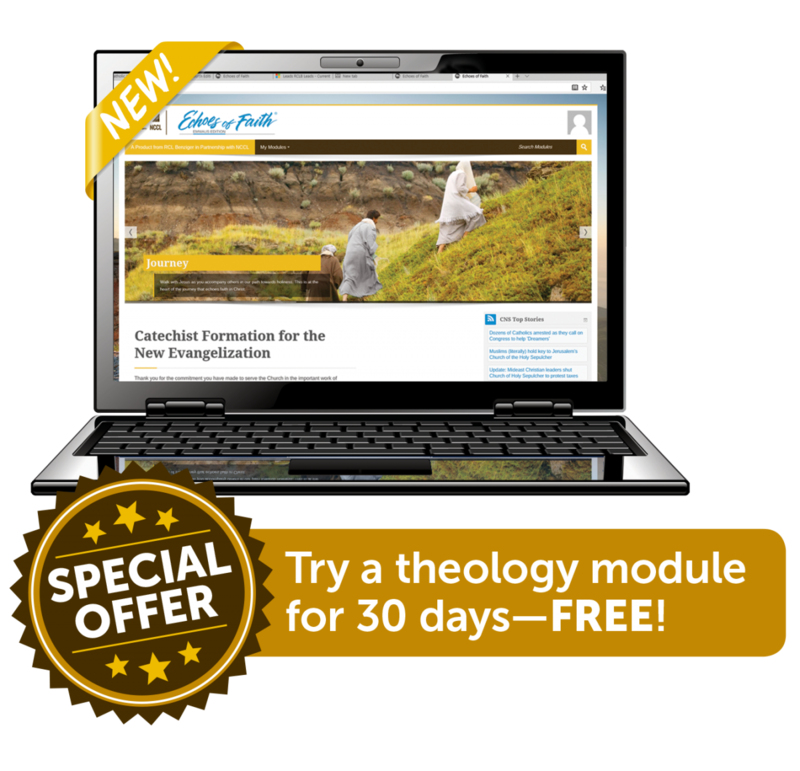 The Affordable Online Resource for RCIA and Adult Formation! Instant online access lets you download, print, and e-mail to anyone in your parish. Based on the Church's time-honored model of apprenticeship, this unique online resource offers a variety of easy-to-use comprehensive handouts. Catechists will find sound background information on Scripture and Church teaching, and are given a clear path for preparation and for sharing their faith. Participants discover solid doctrinal background, reflection questions on the Sunday readings, explanation of key Catholic terms, suggestions, and inspirational quotations from Church leaders and documents. Equip your parish with a comprehensive program to support every period and rite of the RCIA process. Foundations in Faith resources help you blend spiritual and catechetical formation throughout all periods and rites of the RCIA.